Opportunistic interfaces for promoting community awareness and communication. System monitoring for Solaris NEO. 3D visualizations for distributed systems. Program Animation Designer for Parade - EditAnim. KSR Pthread Visualization Package - Gthread. Zhao, Q. Alex and Stasko, John T. What's Happening? : Promoting Community Awareness through Opportunistic, Peripheral Interfaces. In Proceedings of the Working Conference on Advanced Visual Interfaces (AVI 2002), Trento, Italy, May 2002, pp. 69-74. Zhao, Q. Alex and Stasko, John T. What's Happening? The Community Awareness Application. In CHI 2000 Extended Abstracts, 253-254. ACM, 2000. McCrickard, D. Scott and Zhao, Q. Alex. Supporting Information Awareness Using Animated Widgets. In the 7th USENIX Tcl/Tk Conference Proceedings, 117-127. USENIX, 2000. 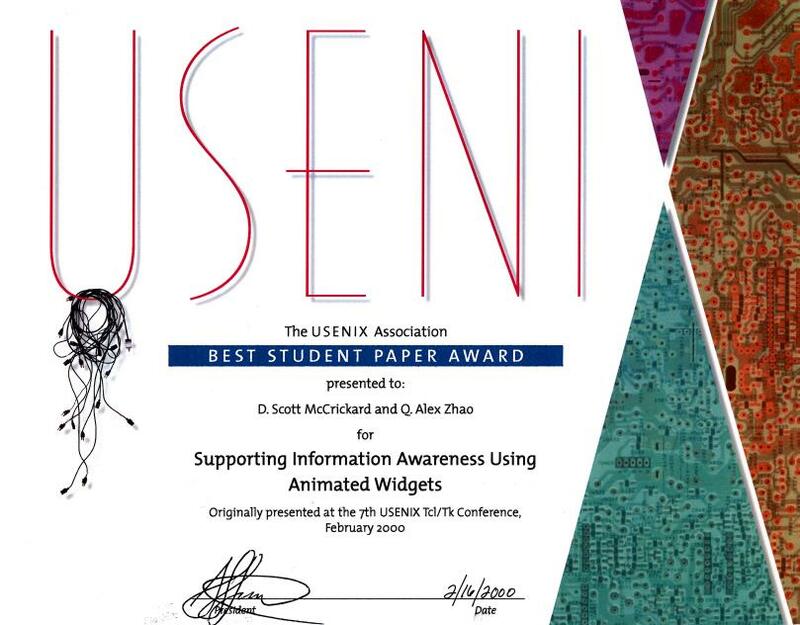 Awarded ``Best Student Paper''. Zhao, Q. Alex and Stasko, John T. Evaluating Image Filtering Based Techniques in Media Space Applications. In CSCW'98 Conference Proceedings, 11-18. ACM, 1998. Zhao, Q. Alex, and McCrickard, D. Scott. Designing Information Awareness Applications in Tcl/Tk. In the 7th USENIX Tcl/Tk Conference On-line Proceedings. USENIX, 2000. Awarded ``Best Poster''. McCrickard, D. Scott, Stasko, John T., and Zhao, Q. Alex. Exploring Animation as a Presentation Technique for Dynamic Information Sources. Graphics, Visualization, and Usability Center, Georgia Institute of Technology, Atlanta, GA, Technical Report GIT-GVU-99-47, December 1999. Zhao, Q. Alex and Stasko, John T. The Awareness-Privacy Tradeoff in Video Supported Informal Awareness: A Study of Image-Filtering Based Techniques. Graphics, Visualization, and Usability Center, Georgia Institute of Technology, Atlanta, GA, Technical Report GIT-GVU-98-16, June 1998. Zhao, Q. Alex and Stasko, John T. Visualizing the Execution of Threads-based Parallel Programs. Graphics, Visualization, and Usability Center, Georgia Institute of Technology, Atlanta, GA, Technical Report GIT-GVU-95-01, January 1995. Zhao, Q. Alex. SRWin: A Graphics Library for SR. Department of Computer Science, University of Arizona, Tucson, AZ, TR93-14, May 1993. His teaching assistant career included CS 4470 Fall '00, CS 4750 Summer '00, CS 7260 Spring '00, CS 6751 Summer '99, CS 1155 Spring '99 (Section B), CS 6751 Winter '99 (Section B), CS 6751 Fall '98, CS 2390 Summer '97, CS 4391 Spring '97, CS 4753 Winter '97, CS 4753 Fall '96 and CS 4753 Spring '95. At one time, he was also a GVU lab assistant. He volunteered at , , , and . Various personal and hobby stuff. Contact Information Résumé Copyright © 1993-2001 Q. Alex Zhao, All Rights Reserved.